Delicious and nutritious vegetarian “steaks”. Easy preparations: you don’t necessary need to dry any incredients by yourself – everything can be found in grocery stores (in Helsinki at least). 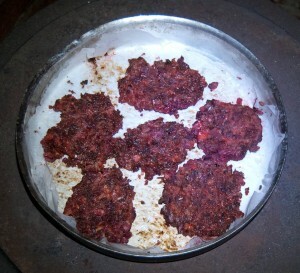 The patties are easy to make wheat, egg and glutene free. Mix the dry incredients together and soad them in 3,5 dl of clean water for two hours at least. Check the amount of water. Put the baking paper on the frying pan and add a bit of oil / butter on it. Create small patties on it with a spoon. Make them small enough – easier to turn them. Bake them ripe from both sides. Don’t turn them too early or the patties will break into small pieces. Make the side dishes: Boil water and make the mashed potatoes. If it’s early summer and you find some willowherb (maitohorsma in Finnish), that makes a beautiful side dish too. Fry the willowherb lightly in butter, add salt and black pepper. This entry was posted in Baked / fried things, Little water, No dehydration and tagged beetroot, potatoes, rye bread, soya flour, soya groats. Bookmark the permalink.